In 1980, Dr. Hubbard moved to Portland from Canada to pursue a professional hockey career. He played three years with the Portland Winter Hawks. In 1981, he was drafted by the Minnesota North Stars of the National Hockey League (NHL). He ended up playing NHL games with the Calgary Flames and the Los Angeles Kings and went on to play professional hockey in Illinois, Michigan, and Wisconsin. A knee injury ended his career in 1987. Dr. Hubbard has been a chiropractic patient since his early teens. During his professional hockey years, Dr. Hubbard and his doctor became good friends. With Dr. Hubbard’s hockey career abruptly ending, his chiropractic doctor suggested he pursue studies in chiropractic medicine. Becoming increasingly interested in the chiropractic field, Dr. Hubbard followed the advice and entered Western States Chiropractic College (now known as University of Western States) in Portland in 1990. After his graduation from Western States Chiropractic College (WSCC) in 1994, Dr. Hubbard opened his first practice in Tigard, OR and pursued a formal education career teaching at WSCC. Dr. Hubbard closed his practice in 1999 and returned to hockey when he took coaching positions in Eugene, OR and Great Falls, MT. He had been coaching kid’s hockey since 1988 and was offered a coaching position at a higher level which was Eugene. Dr. Hubbard was part of USA Hockey and travelled annually to St. Cloud, MN to coach Pacific District (elite players from Alaska, Washington, Oregon, California, Hawaii, Idaho, and Nevada) in a National Tournament. Following the birth of his son in 2002, Dr. Hubbard chose to stay home and resumed his chiropractic practice as Director of Technical Service with an established clinic in the historic Sellwood area of Portland. Dr. 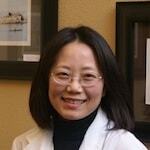 In Yu, DAOM, LAc, is a master’s program clinical faculty member at the Oregon College of Oriental Medicine. She has been working as an Independent Medical Examiner (IME) in acupuncture and oriental medicine for the State of Oregon and has served this distinction since 2011. During her doctoral education at the Oregon College of Oriental Medicine, she furthered her focus on individualized patient care through her research at Kyung Hee University in South Korea. Her practice provides a holistic, preventative medical approach. Through a combination of acupuncture, herbology, dieting, and nutrition, her treatments help to strengthen patients by enhancing the body’s self-healing abilities. From her medical experience, Dr. Yu believes that successful and sustainable patient treatment can be achieved through natural methods. Her passion stems from helping patients reach their health goals specifically in promoting vitality, sustaining health, boosting immune systems, and maintaining optimal physical harmony. Publications: “Sasang Constitutional Medicine” 2012, Oregon College of Oriental Medicine.